Back in the day, my friends and I used to scale the beautiful, sheer cliffs near New Paltz, New York. I have fond memories moving up the Shawangunk Conglomerate, warmed by the summer morning sun, looking out upon the forest canopy below. 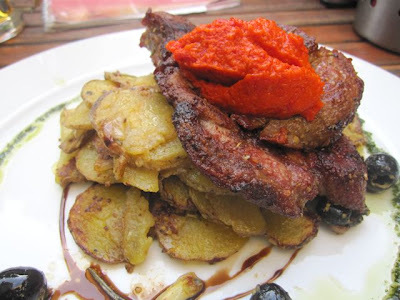 So when a reader recommended Lokal Blok on the Czech Please Facebook page, it got my attention. This place in Anděl-Smíchov is unusual. 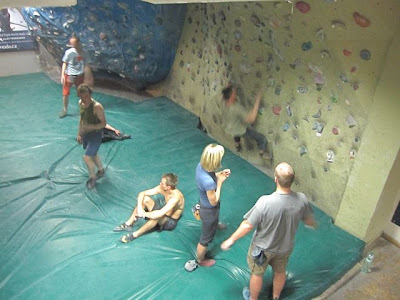 Not only is it a restaurant, but it also has rock climbing walls in the basement. If you want to work on your lean back, overhang moves before you eat, this is the place to go. I don't do that anymore, but I knew I had to check it out. The restaurant upstairs is quite large. There are three different dining sections, plus a big garden deck in back. On one early evening, the place was jam-packed with an exclusively young crowd. Throbbing rock music blasted over the sound system. I sat with a friend in the front smoking section near the bar. It was very smoky. Another Facebook reader told me the restaurant will be all non-smoking starting June 1st. I started off drinking sparkling water. 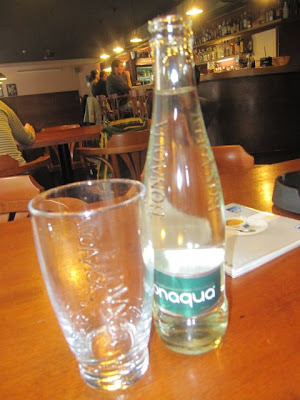 It was my least favorite, Bonaqua (28 CZK). One reason I don't like it is the small .25 liter bottle it comes in. I prefer quenching more of my thirst with a .33 liter bottle of Mattoni. 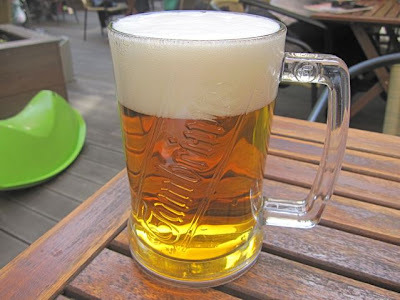 During the meal, I had a half-liter glass of Pilsner Urquell (36 CZK). At the end, I had a Jack Daniel's with a little ice (75 CZK). I was having a hard day. 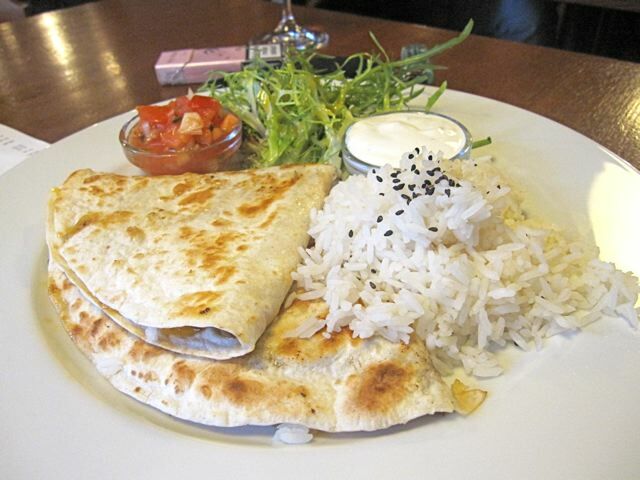 My friend wasn't too hungry and ordered the cheddar and jalapeno quesadilla (125 CZK). This was a decent snack, but it didn't reach any great heights. The salsa, with freshly chopped tomato, was bland. I also thought that plain white rice didn't partner well with a quesadilla. I wanted to order a standard hamburger, but the menu caused me some confusion. On the first page under "Big Sandwiches," one came with grilled hamburger meat. So I ordered that one (105 CZK). 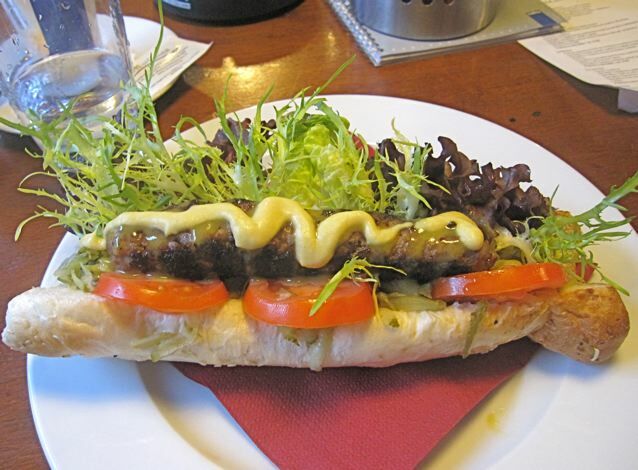 It turned out to be an actual sandwich, with sausage-shaped ground meat served on a long, chewy roll. Fancy lettuce, tomatoes, and a sweet mustard sauce were spilling out of the bread. The bigger, regular burger, served on a proper bun, was listed a couple of pages later in the "Meat" section (135 CZK). The seasoned meat tasted a lot like meat loaf. I was told that this is because the ground beef is mixed with buckwheat. It wasn't bad, but you really have to get yourself in a meat loaf sandwich mood to enjoy it. It tasted nothing like a classic burger patty. I didn't like the cold, chewy roll that was too small, or that it was slathered with such an intensely sweet mustard. However, I was still in the mood for something sweet at the end of the meal. 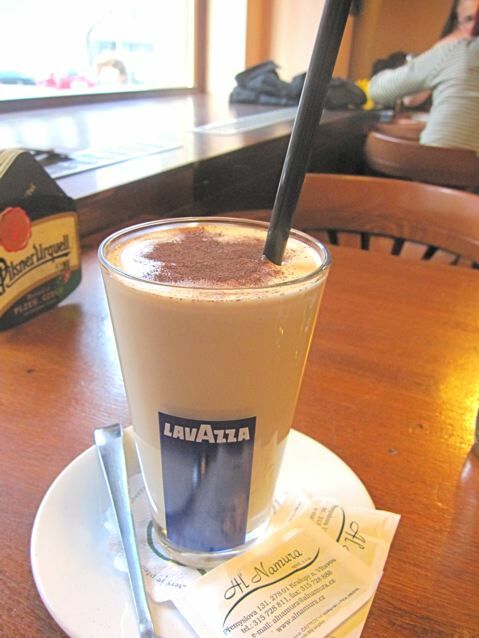 I ordered the ice cappuccino (48 CZK). It was the kind made with ice cream, which I usually like. But this version was mostly froth and was lacking in flavor. It wasn't even very cold. It needed much more ice cream. 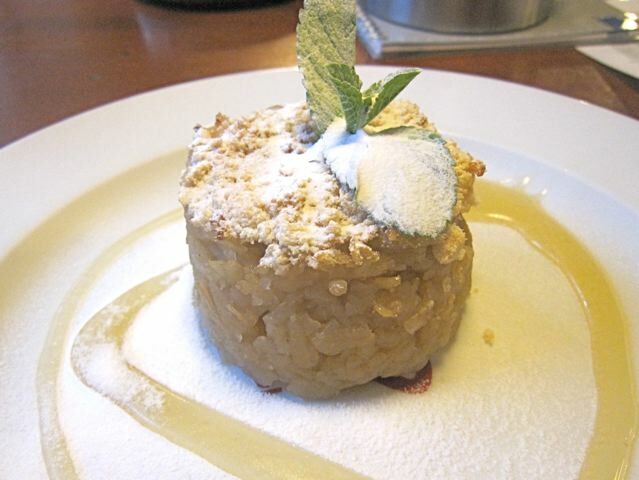 To go with it, I got the Apple Crumble (45 CZK). This lifted me up a bit. The finely chopped apple, served warm, was topped with cake crumbs, and powdered sugar. It was very sweet, but here, I minded less. There was a barely detectable amount of rum. It was something like an apple strudel without all the dough. I came back alone for another visit on a beautiful spring afternoon and headed straight for the garden in back. I was very lucky and got one of the last tables. It wasn't a forest, but I was surrounded by a lot of green. Several diners were turned away after I got there. I sat near a window looking into their clean, large, well-organized kitchen. While checking out the drinks menu, I saw something I hadn't noticed before. 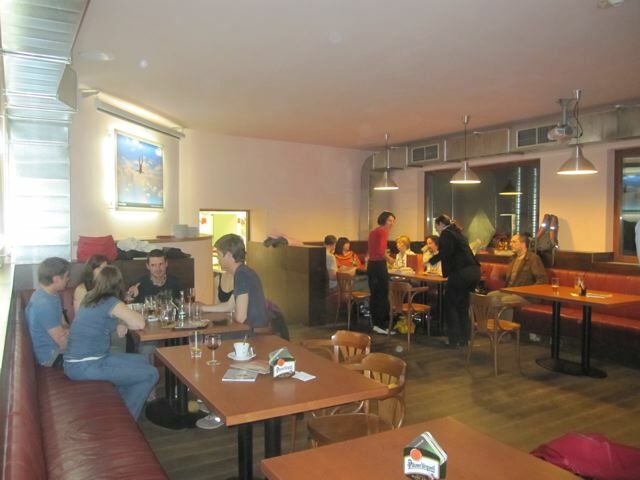 Lokal Blok was serving unpasteurized Gambrinus from a tank. I've seen Pilsner Urquell served this way all over town, but never its weaker, 10 degree SABMiller brewery mate. 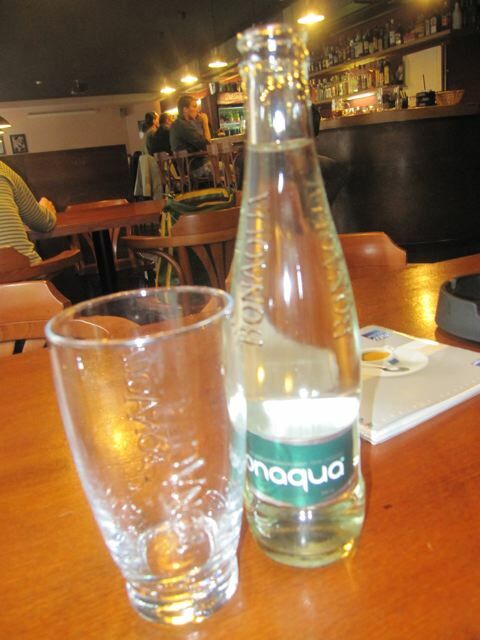 I ordered a half-liter (28 CZK). It was very good, maybe the best version of Gambrinus you'll find. But this beer just doesn't taste as good as Pilsner, which they also have on regular draft. 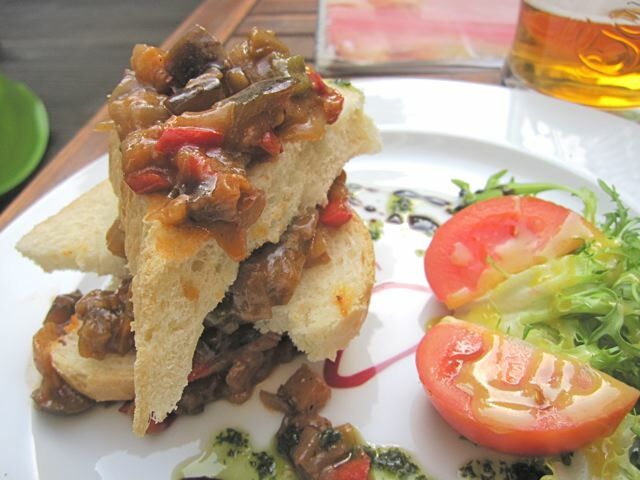 For a starter, I decided to try the roasted eggplant and pepper tartare (75 CZK). It was attractively, yet awkwardly presented, with bread stacked up on the plate. But the taste counts the most. I liked it a lot. It was more salty than tart, but the flavors of the cooked red, yellow, and green peppers, mixed with the eggplant, balanced it out well. The bread also soaked up the good pesto and balsamic vinegar that swirled on the plate. It was advertised as mildly spicy, but it was barely so. My only criticism was that the thick, cold bread could have been better or perhaps toasted. For my main, I was in the mood for pork. I recently had a rather disastrous pork neck/shoulder at Kulaťák, and I thought it would be good to see how they compare. So I ordered the Krkovice (155 CZK). Lokal Blok's was better in every way. This pork steak was bigger (two pieces! ), looked great, the seasonings were on the mark, the porcine flavor was just right, and it was 24 crowns cheaper than Kulaťák's. It got dryer toward the less fatty parts in the middle, but that's about it. There was a big dollop of ajvar on top to help moisten it up. Even better, the thinly sliced new potatoes underneath were plentiful and delicious. They were cooked with whole-grain mustard, and it was slightly sweet. I still liked the pesto and balsamic on the plate, even though it was rather repetitive after having it with the starter. I have to say, my first visit to this restaurant left me feeling disappointed. I thought it fell flat. But my second visit was so much better in almost every way. In fact, on a warm summer day, Lokal Blok has climbed to the top of my list of places to go in Smíchov. Especially if I can get a spot in the garden. Just wanted to comment on a new pizza place but I couldn't find a "pizza" category in your listings, so I'll put it here, your latest review. Found "pizzacompany.cz" at the Muzeum metro a while back and finally ordered some a few days back. 170 kcs (+ 15 kcs for a box) for a 45 cm "piccante" za which did a great job of tasting both American and being thin crust too. They put whole, uncut chilli peppers on it (the ones you get in the "bio" section of Billa, Tesco, et al.) which I immediately removed, but I've got to say I'll order it again (and remove them again) as they left a nice spicy taste. I really don't understand the purpose of not slicing these (or at least removing the stems), other than to save time / money for the company. Had a couple of pieces cold from the fridge this morning and again loved the taste (yeah, okay, this may be an American thing -- so sue me -- but it was damned good). 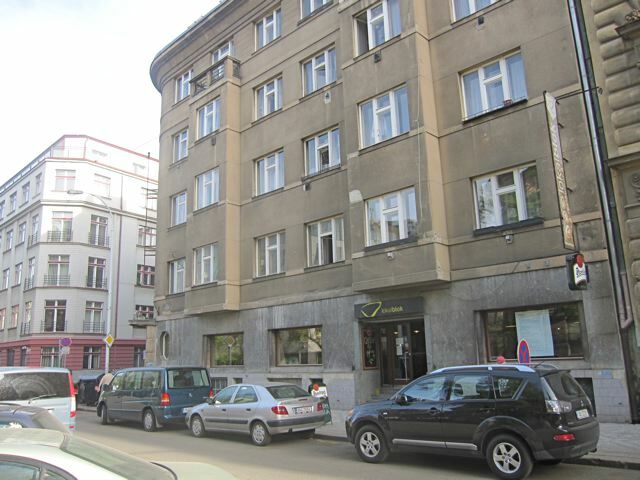 HUGE negative about this place is that they apparently don't deliver, despite now having 5 locations in Prague. Why oh why does this have to be??? Labour here costs next to nothing and surely a few scooters can't cost too much (nevermind the fact they're great advertising as they wind their ways through traffic). Also -- and this was at least half as annoying -- the pizza & the box itself were lukewarm when I picked them up at the kiosk, despite having ordered only about 15 minutes previously. No excuse for that; zero. Put the waiting za in its box on top of the pizza oven for crying out loud!!! Anyway, I'll certainly be ordering from these guys again, but nowhere near as much as I would if they had delivery. I see, beer should be important part of this country's culture, next meat dishes, no? 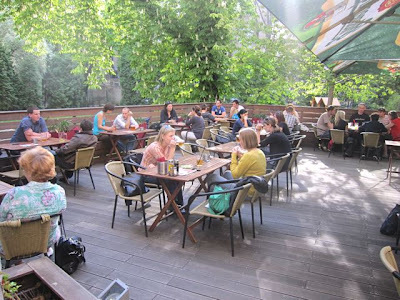 I write a blog about Czech pubs and the beer they serve. 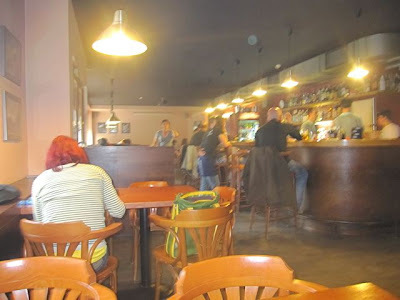 There are a few pubs that serve fantastic Gambrinus. U Jeceme is probably the best Gambrinus I've had in Prague. U Holanu in Vinohrady is a close second. They're both great typical Czech pubs. 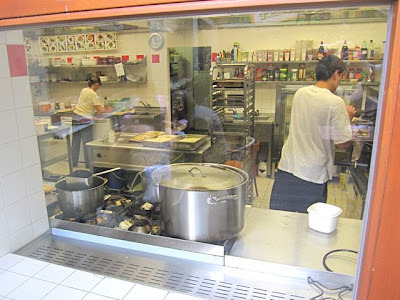 Great blog by the way, I read it often (I have a deep seated love for Thai food as well)!